This is an excerpt from our book on RTL-SDR which we've decided to post given that many new users struggle to understand all the settings in SDR#. SDR# is currently the most popular SDR program used with the RTL-SDR. It's easy to set up and use. To install SDR#, go through our Quickstart Guide. Below we explain some of the settings and displays in SDR#. Increase the RF gain from zero to a higher value in the configure menu. 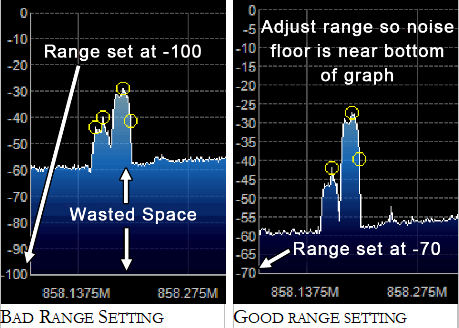 Reduce the range slider on the right of the SDR# window to about -70 (for RTL-SDR dongles). Enable the “Correct IQ” setting to remove the center spike if using an R820T/R820T2, or enable “Offset Tuning” in the configure menu if using an E4000/FC0012/13. Turn off the “Snap to grid” setting, or adjust the PPM offset accordingly. Set the 'Mode' to the correct setting for the signal that you are listing to. Note that there is a distinction in SDR# between settings that affect the software side, and settings that affect the hardware side. All hardware side settings can be found in the Configure Menu window which can be accessed with the cog icon . In here are settings to control things like the RF gain and sample rate / bandwidth of the RTL-SDR. To optimize reception, you need to adjust settings in this window. Most of the settings found in the main windows of SDR# affect the software digital signal processing (DSP) side of things. To optimize processing of the signal you need to adjust these DSP settings. Stop Button This button is used to start and stop the SDR. Source This is a drop down menu which is used to select the SDR input device being used. If you are using an RTL-SDR, select RTL-SDR/USB. Be sure to NOT select RTL-SDR/TCP unless you are using a remote server with rtl_tcp. Menu Clicking this button opens up the configure menu. In here you can change settings like the sample rate (bandwidth) and RF gain. See further down for more information about these settings. Use the mouse to set the desired frequency you wish to listen to here. You can either click on the tops and bottoms of each individual number to increase or decrease the value, or simply hover over the number you want to change and use the mouse wheel to alter the value. The frequency input is divided into 4 sections with each section containing 3 values (e.g. 000.000.000.000). The first section represents GHz frequency values, the second MHz, the third kHz and the last Hz. For example to tune to a radio station at 88.6 MHz we would enter 000.088.600.000 into the frequency input. To tune to 861.5475 MHz we would enter 000.861.547.500. To tune to 1.575 GHz we would enter 001.575.000.000. To tune to 500 kHz (with an upconverter and appropriate offset shift set (discussed later)) we would tune to 000.000.500.000. Volume Set the volume level of your output speakers or audio piping device here. RF Spectrum / FFT Display This part of the window shows the RF spectrum as a graph in real time visually. Active signals will appear as peaks on this graph. RF Waterfall This part of the window shows the RF spectrum graph spread over time with new data at the top and old data at the bottom, just like a waterfall. The vertical red line in the RF spectrum graph shows where on the RF spectrum the RTL-SDR is currently tuned to. Within the currently active chunk of instantaneous bandwidth the tuning can be altered by simply using the mouse to click and drag the red line, or just by clicking elsewhere in the RF spectrum. The shaded rectangular area around the red line shows the bandwidth of the tuned area (don’t confuse this with the bandwidth/sample rate that is set in the configure menu). The bandwidth should be set so that it covers the area of the signal that is tuned. The bandwidth can be adjusted by using the mouse to simply drag the edges of the shaded area in or out. Here you can choose what type of demodulation mode the signal at your currently tuned frequency should use. Commonly used mode used by walkie talkie radios, weather radio and most VHF/UHF digital signals. This is the mode that broadcast FM stations use (e.g. radio music stations). Used by broadcast AM stations that are receivable by normal shortwave radios and also used by air band voice frequencies used by aircraft and air traffic control. Some digital signals also use AM. Used in the HF band by ham radio users to transmit voice and data efficiently with small bandwidths. CW Continuous Wave Used for listening to Morse code. Similar use to AM, but requires centered tuning. This box offsets the tuned frequency by the amount entered. This is useful if you are using an upconverter. For example if you have an upconverter with a 100 MHz oscillator, you would set the shift to be -100,000,000 (don’t forget the minus sign). Without the shift, when using an upconverter to tune to a signal at 9 MHz you would need to actually tune to 100 + 9 = 109 MHz. With the shift set, you can tune to 9 MHz as normal. If you have an upconverter with a 125 MHz oscillator you would tune to 125 + 9 = 134 MHz, or set the shift to -125,000,000. This is the width of the shaded part of the tunable area. You can set it manually here, or by dragging the edges with the mouse as described under the tuning bar description. Changes the filter type used. Different filters have different shapes. The filter is used to select the highlighted signal in the RF window. Blackman-Harris is usually the best filter to choose and this setting almost never needs to be changed. Changes the filter order. 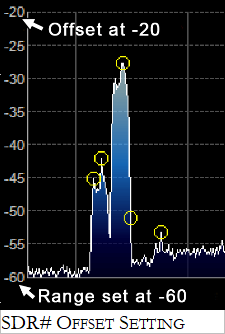 You may notice when using low filter orders that signals outside of the tuned bandwidth can still be heard. Larger filter orders “tighten” or “sharpen” the band pass filter used within the tuned bandwidth/IF thus preventing signals outside of the tuned bandwidth from being heard. You will want to increase the filter order when there are strong signals near to your tuned area. Using higher filter orders can cause a greater load on the CPU, so slow PCs may need to reduce this value. Squelch is used to mute the audio when the signal strength is below the specified value. A larger value requires a stronger signal to unmute the audio. It is useful for when listening to speech as the sound of static when no one is talking will be muted. Mainly useful for when receiving CW (Morse code) as it specifies the offset between CW transmit and receive frequencies. Will enable stereo output for broadcast radio WFM signals, but can make weak stations sound worse. In many bands frequencies are allocated at a fixed distance apart. For instance in most countries air band signals are spaced 25 kHz apart (or 8.33 kHz in some countries). Turning on snap to grid can help with tuning by causing the tuning bar to snap directly to a signal. However, to use this with a non-TCXO RTL-SDR the PPM frequency offset correction must be set correctly, otherwise the frequencies may not line up. The snap to step size can be set in the “Step Size” pull down menu. Should usually be selected as ON. This setting removes the small but annoying center spike that is present with R820T/R820T2 RTL-SDR dongles. Only active in AM or DSB mode. Allows for synchronous AM which can significantly improve reception and also automatically centers the signal on the carrier. Turn this on for better AM reception, but may increase CPU usage. Can be used when “Lock Carrier” is activated. Takes advantage of the symmetry of AM signals which helps with weak signals when they may be fading in and out. Turn this on for better AM reception, but may increase CPU usage. If you are using SDR# as a panadapter, some hardware radios may have the I & Q signals swapped and need this option checked. Simply marks any peak in the RF spectrum with a circle. This tab allows you to adjust settings related to the audio processing. 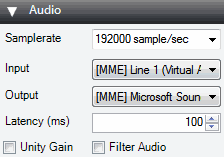 Sets the sample rate of your sound card. Some decoding software may require a specific sample rate to be set. Usually the default value should be fine for general listening. This is normally greyed out unless using a sound card based SDR. Specifies the input sound card when using SDR# with the “Other (Sound Card)” source. Used mainly with sound card based software defined radios. In normal use with an RTL-SDR this does not need to be set. Sets the audio output device. By default it is set to your speakers. If you are passing the audio to a decoder program here you would choose your virtual audio pipe (VAC/VB Cable) to send the audio to. 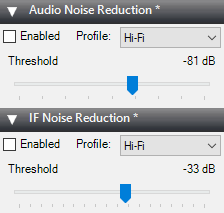 Should normally be unchecked as it sets the audio gain to 0 dB. Improves voice signals by filtering the audio, removing high pitched hiss and DC noise. Should normally be off if decoding digital signals, but may actually help in some cases if there is significant DC offset. Note that in some modes the AGC tab will be greyed out. Turns on the audio automatic gain control. The AGC will attempt control the audio volume level so that loud sounds are not too loud and quiet sounds are not too quiet. The default settings work well for voice audio signals. It is especially useful to turn this on when listening to AM/USB/LSB signals as strong signals in these modes may sound distorted otherwise. Allows you to modify the default AGC behavior, though in most cases the defaults are fine. The FFT display settings adjust options related to the spectrum analyzer screen and the waterfall. Set it to view both the RF spectrum and the waterfall, or only one of them, or none at all. Removing the waterfall may be useful on older PCs with slow processing hardware. Sets the type of windowing algorithm to use on the FFT, the default of Blackman-Harris 4 is the best in most cases. Increasing the resolution will increase the quality of how the signal looks in the RF display and waterfall. Using a higher resolution may be useful when fine tuning, as high resolutions will allow you to see the peaks and structure of a signal much more clearly. Beware that high resolutions can slow your PC down and can cause trouble especially with single core machines. Generally, a value of at least 32768 should be used if your PC can handle it. Adds time markers on the waterfall display, so you know at what time a particular signal was broadcasting. Allows you to customize the colors used in the waterfall display. Adds a circular marker on every signal peak on the RF spectrum. Changes the amount of smoothing and averaging done in the RF spectrum display. Changes the amount of smoothing and averaging done in the waterfall display. Changes how fast the RF spectrum and waterfall updates. Zoom FFT is a plugin that comes by default with SDR#. It creates a zoomed in RF spectrum display of the tuned IF bandwidth at the bottom of SDR#. 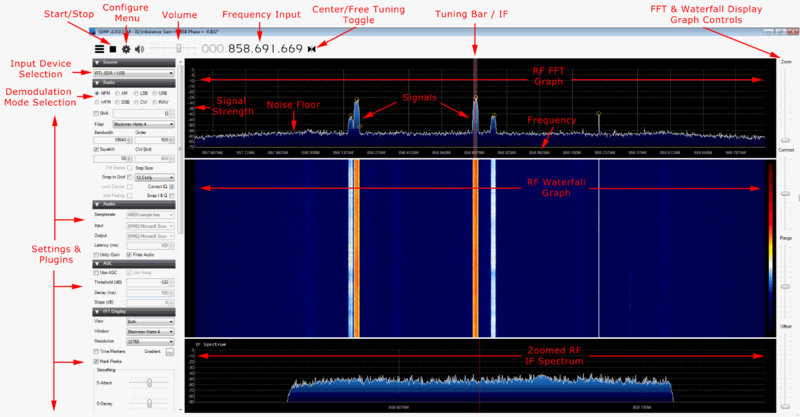 Opens a “zoomed in” RF spectrum graph around the area of your tuned IF bandwidth. Allows you to see the signal structure with much greater resolution. If Enable IF is checked, then you can enable a special adjustable IF filter. This filter allows you to filter the left and right side of the tuned IF bandwidth individually. Enables you to see the MPX spectrum of a broadcast FM radio station. Broadcast FM is encoded in a special baseband audio format called MPX. It contains a mono section, a pilot tone and a stereo section, as well as sometimes subcarrier sections for data like RDS and special radio services like SCA. If you were to try and view the audio baseband with the “Enable Audio” button, you wouldn’t see the MPX structure because SDR# would have processed it into normal audio, and discarded the subcarriers and other sections. Allows you to see the audio (baseband) spectrum. It is useful to turn on digital noise reduction when listening to weak and noisy analogue voice signals. This setting will attempt to reduce the background ‘hiss’ sound. There are two DNR options available, IF and Audio. The IF uses the noise reduction algorithm on the IF signal and the Audio option does it on the output audio signal. Usually the IF digital noise reduction works best and should be tried first, though a combination of both may work best. The sliders control the strength of the algorithm applied, and the profile can be optimized for the type of audio you are listening to. The profile options are Hi-Fi, Talk, Speech, Narrow Band and custom. The noise blanker is an algorithm that can be turned on to help reduce impulsive and pulsing like noise from sources like spark gaps. Examples of this type of noise may come from motors, electricity lines, power over Ethernet and switching power supplies. Carefully using this option can really help when receiving a weak signal amongst pulsating noise, which is mostly common on the HF bands. The noise blanker works by simply removing any samples that have large pulses of energy in them. 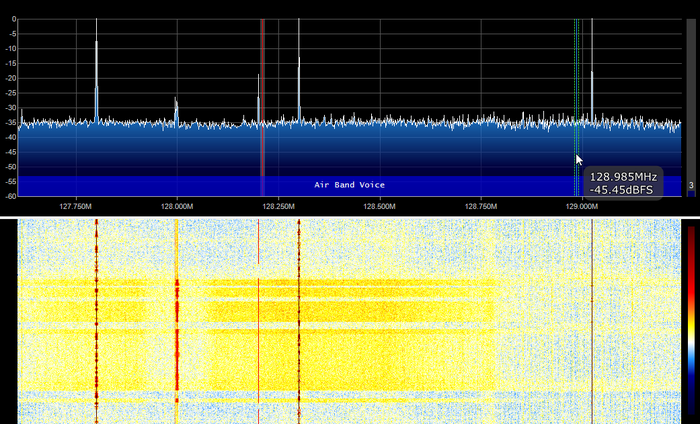 In SDR# there are two different types of noise blanker. The baseband noise blanker works on the entire spectrum and will remove pulses from the FFT and waterfall, whereas the demodulator noise blanker only works within the tuned area that is currently being demodulated. Tuning the settings is mainly an exercise in trial an error. Move the sliders until the pulsating noise goes away, whilst trying to keep the signal active. The recording tab allows you to make I/Q and Audio recordings. The sample format allows you to choose the level of recording quality needed. Since the RTL-SDR is only about 8-bits, we can select the lowest 8 Bit PCM option. Using only 8-bits saves a significant amount of disk space. An I/Q recording is a recording of the entire ~2 MHz bandwidth that you are currently tuned to. It saves the RF data within the bandwidth so you can replay it at a later time. An I/Q recording can be made by checking the “Baseband” check box. Note that I/Q recordings can use up a lot of disk space, so make sure to watch the File Size and Duration status counters. I/Q recordings can be played back in SDR# by selecting IQ File (*.wav) from the source menu. If you receive a lot of dropped buffers, then your PC or disk may simply not be fast enough to process the recording. Remember that baseband recordings use a lot of disk space. The audio coming out of the speakers can be recorded by checking the “Audio” check box. 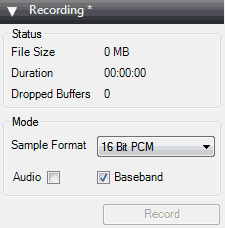 This will record audio to a standard audio .wav file. All recorded files are stored in the same folder as the SDR# executable. The frequency manager allows you to save any frequencies of interest in a database. A new frequency can be added to the database by clicking in the New button. This will add a frequency with the current tuned frequency and settings like bandwidth. You can edit the frequencies name and put it into a group for easy management. Double clicking on a stored entry will instantly tune SDR# to that frequency, and set the stored mode and bandwidth. If you check the “Show on spectrum” check box then your saved frequencies will be displayed in the RF spectrum. The sliders on the right adjust the graph display settings for the RF spectrum and waterfall. Moving this slider will cause the RF spectrum and waterfall to zoom in on your tuned IF bandwidth area in order to see a signal closeup. However, the more you zoom in, the lower the resolution will seem. An alternative to zooming is to either reduce the sample rate, or to use the special decimation drivers. These alternative methods will preserve the visual resolution and allow you to see the signal structure much more clearly. Adjusts the contrast of the waterfall. Adjust it so that signals clearly stand out from the background noise. Modifies the dB level range shown on the left (vertical) axis of the RF spectrum window. You should adjust this so that the noise floor sits near the bottom of the RF spectrum window. This will allow signals to be more visible in the FFT RF spectrum and waterfall displays. As the RTL-SDR has a dynamic range of approximately 50 dB (plus a little more after oversampling/decimation), you will not need a range much higher than 0 to -70 dB. This setting will also affect the contrast in the waterfall and may help make weak signals easier to spot. Adds an offset to the dB level range in the RF spectrum window. The offset is added to the top value on the dB level range in the RF spectrum. Usually there is no need to adjust this, but if you want to get really good contrast on weak signals, adjust this along with the range so that the signal height is the same height as the vertical axis. This setting will also affect the contrast in the waterfall and may help make weak signals easier to spot. The SDR# configure window can be accessed by clicking on the cog icon at the top of the SDR# window. 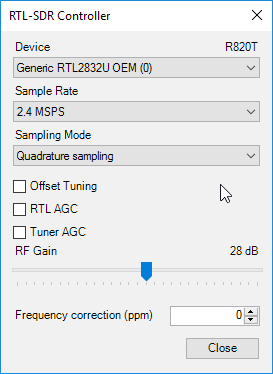 The settings in this window affect the actual RF performance of the RTL-SDR, and should be set correctly to optimize the signal to noise ratio (SNR). The configure window has several options which are described below. Remember that some options may be greyed out until you press stop in SDR#. If you have multiple RTL-SDR dongles plugged in, the device drop down menu allows you to choose between them. Lets you choose the size of the instantaneous bandwidth the RTL-SDR should display. Generally settings of up to 2.8 MSPS work well on most PCs, but if you have a slow PC you may want to reduce this. We recommend a default rate of 2.048 or 2.4 MSPS. Use Quadrature sampling for normal operation. The direct sampling selections should be used when using an RTL-SDR that supports it. Only useful for the E4000/FC0012/13 tuners. Selecting this will get rid of the large spike in the center of the spectrum that is present with the E4000/FC0012/13 zero IF tuners. Enables automatic gain control on the RTL2832U chip. This is normally not useful as selecting this usually degrades reception. Enables the automatic gain control system on the tuner chip. Can be useful for general browsing, but it is almost always better to set the gain manually. This slider can be used to set the tuner RF gain manually. Will not be active if Tuner AGC is checked. Standard Dongle: Adjust for freq. accuracy. Allows you to correct the frequency offset that RTL-SDRs have from having low quality crystal oscillators. There are three RF gain settings that can be found by clicking on the Configure button. RTL AGC turns on the RTL2832U chips internal automatic gain control (AGC) algorithm. Tuner AGC enables the RTL-SDR tuners AGC. The AGC’s attempt to automatically optimize the SNR of the signals. Finally, the gain slider can be used to manually set the gain. The AGCs used in the RTL-SDR are designed to be used with wideband DVB-T signals, and do not work very well with narrowband signals. We recommend using manual gain control at all times to optimize the gain of a signal, however for casual browsing turning on Tuner AGC may suffice. RTL AGC is almost never used as it tends to just introduce a lot of unwanted noise. The goal when setting the RF gain manually is to try and get the signal to noise ratio (SNR) as high as possible. This means that the maximum signal strength should be high, but the noise floor should also be as low as possible. When increasing the gain, there will come a point at which the noise floor begins to rise faster than the signal strength rises. This is the point at which you should stop increasing the gain. You can calculate the signal to noise ratio by subtracting the peak signal height from the height of the noise floor. In SDR's (and all radio's for that matter), overload is when a signal that is too strong enters the radio and causes “saturation”. An analogy might be trying to listen to your friend talking to you at a loud concert. The music from the speakers is so loud that you can't hear what they are saying. The same thing can happen in radios. For example if the SDR cannot cope with a strong signal and starts overloading, weaker signals will no longer be able to be heard. This can happen even if there is a strong signal hundreds of MHz away from your target signal, though the closer in frequency it is the more problematic it will be. The biggest causes of overload are broadcast FM signals, pagers, TV broadcasts, DAB radio and GSM signals. The first solution to overload is to simply turn the gain down. But turning the gain down can also make your desired signal weaker, so ideally you'd use a filter to remove those unwanted strong signals, or buy a more expensive 12-bit or higher SDR which can handle strong signals much better. In this section we'll show you what overload looks like on SDR#, so you'll know when to recognize if there is a problem. Overload can manifest itself as images of the strong signal at frequencies where they're not meant to be. 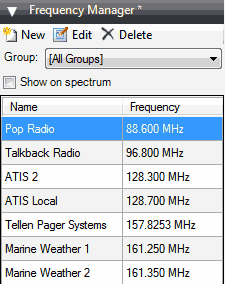 For example in the image below there are broadcast FM stations at 206 MHz, and they definitely should not be there. Simply turning down the gain causes them to disappear. It can also manifest as a rise in the noise floor. For example in the image below a strong pager signal is causing the noise floor to rise whenever it transmits, and then fall again when it stops. If you are tuned only a few MHz away from a very strong signal it can cause all sorts of weird images to show up . For example in this image below, whenever the pager transmits it causes strange signal spikes all over this part of the spectrum. Of course overload can also cause the noise floor to rise so high that the signal is no longer visible at all. There are many plugins available for SDR# that extend its functionality. We recommend visiting rtl-sdr.com/sdrsharp-plugins for a list and brief overview of these plugins. To install plugins you will most often need to copy a .dll file to the SDR# directory and add a 'magic line' text entry to the Plugins.xml text file which can be found in the SDR# directory. You will need to open this file in Notepad or another text editor to read it. The readme file that usually comes in the plugin zip file will usually tell you what the 'magic line' is. The line should be added between the <sharpPlugins> </sharpPlugins> tags. Note that some older plugin readme files may still instruct you to add the line to the SDRSharp.exe.config file. This was used in older SDR# versions and is now incorrect. The line should be added to the plugins.xml file now. By far the best setup guide I have found. The user guide was very helpful. SDR is relatively new to me so still learning what is all about. Most of my experience is with amateur radio. I have problem with recording audio when using SDRSharp and RLTL-SDR. I want fixed gain, not automatic gain control for audio. How do I adjust the recording level manually ?? I run an RTL SDR server from Osmocom on my Raspi. This is now also in operation for 2-3 months. I am very satisfied with the idea of ​​the SDR server, the result is very good on VHF and UHF. A few days ago I bought a new RTL SDR receiver, this time also for the KW reception. The KW reception is possible via direct sampling. With the new stick, however, I have the problem that the sampling mode selection of the SDR # v.1.0.0.1700 only with RTL-SDR (USB) is available as a source USB. If I select RTL-SDR (TCP) as source, I do not get sampling mode selection to toggle between quadrature sampling and direct sampling (Q branch). Unfortunately, it is still possible to receive only VHF and UHF via the SDR server. About USB the making a selection for the sampling mode in the SDR # as I said possible, under TCP, this selection point just does not exist. How do I save signal data as a file using SDRSharp? how to receive digital modulated and amplitude modulated(AM) audio signals on this software? I’m not the sharpest tool in the shed when it comes to computer language. I see all the comments about…s/ware control, Zadig driver, copy in “BandPlan.xml” and “frequencies.xml”…and so on, and it’s all hieroglyphics. I purchased an RTL-SDR a year ago, and tried to get it to work on a laptop, but couldn’t so i sold it to a friend; dont know that he got it to work either. I want to play too like you guys 😉 , and have been doing RF for over 30 years; building/maintaining POCSAG/GOLAY paging towers, VHF/UHF repeaters, and 800MHz Motorola/GEDACS/LTR trunking systems, but am LOST with the computer lingo. What is the easiest way to get one of these up and running on my laptop? 2. Can I purchase a setup that’s plug-n-play? 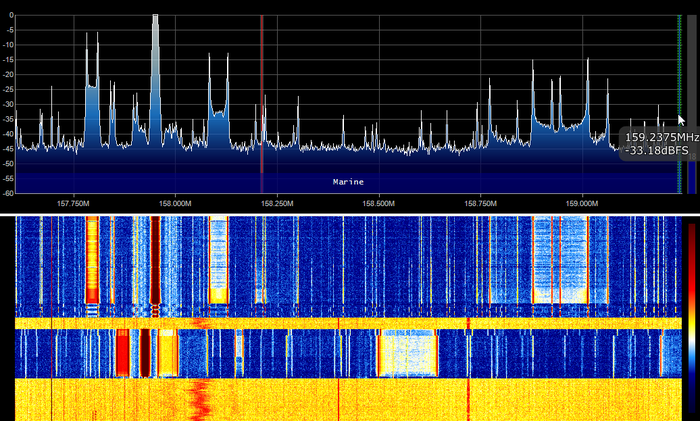 SdrSharp is daunting as it is so powerful with a large number of user settings. We use SdrSharp to set up recording systems, and have a .zip file that have everything pre-set to suit our specific situation. This might work for you too, and once you something (anything) working you can modify it from there. I’ll send you the .zip files that we use when setting up a new recording system using SdrSharp. These might (or might not) work in your situation, but if they work at all will give you a starting point. Hello, is there a method to play a .wav file on my computer that is not recorded using the SDR#? I am recording reception using a kiwisdr radio accessed over the web. 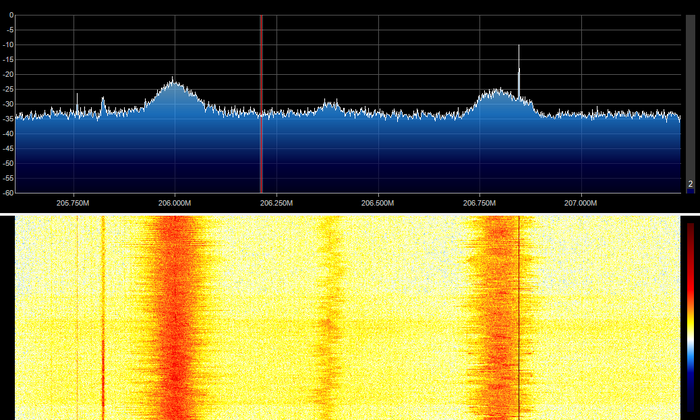 I would like to use SDR# audio capabilities to clean up the reception. I get “invalid file format.” Is there a way around this? I’m not familiar with the kiwisdr, but is there an option to save as some form of raw IQ file ? If there is not then you are trying to manipulate an audio file with software that is designed to process and manipulate raw IQ data. You might have better luck using audacity or even Adobe Audition which are designed to process audio files (and know nothing about raw IQ data). How to hook up a coax cable that is on one end connected to a splitter that is connected to the internet providers hub with tv, internet connectors. That all works connecting the other end simply to a coax connector on a tuner, female. Now, I got this little screw without pin on the dongle. I got a sma to sma connector. I can screw this on. Then on this connector another connector, female to another end to hook the coax on. But I do not know if these are right connectors to use. What a bunch of connectors my God. Just to hook up a coax cable. The test antenna only picks up strong stations. Is there any way of invoking SDR# in ‘play’ mode? I’m running it on a remote machine so am not on site to click the ‘play’ triangle. I’m clicking it under s/ware control, but that’s not ideal as the computer is sometimes busy with updates etc. I want to install orbitron in the latest version of sdrsharp maybe someone could indicate how I could do it. Thanks for the reply. Im still missing something. I created a folder named sdr#1667 inside the main SDR# folder (current rev) and placed SDRSharp.exe (rev 1667) there. Nothing happens when I open the new rev. It works fine with my rev 1637. Im not getting what you describe. Do I need to run zadig again for new revision? Thanks. And then I copy in “BandPlan.xml” and “frequencies.xml” because I customised mine. I’d go about adding any plugins I use one at a time, to see which one are broken (if any) by newly added features. So then I know which plugins I need to wait on those developers to make releases. And if anything is broken by the newest release or just does not work as I would expect, I still have my old folders with a fully functioning previous releases. Got it ! Obvious once it worked! Im new to SDR# so its time to look at plug-ins. Thanks much. I own two scanner radios popular in the 1990’s- AOR AR 3000A’s. Each radio has a port in the back for a 25 pin serial cable. Each has a switch on the backside labeled: Remote: on off. Are there options/settings somewhere in the SDR# package that will allow me to link up SDR# with my old fashioned hardware? Is there a soldering iron kind of a fix I need to make on the circuit boards of my AOR AR 3000A’s to get them working with SDR#? There used to be software packages built for my machines but they went out of fashion as digital became popular. Could I use SDR# as a kind of a ‘plug in’ in a software package purpose built for my AOR AR 3000A’s? Can I use OmniRip to control my Yaesu FT-950 w/an RSP2? You are using a confusion name. Why? SDR# is unquestionably the best program out there. Many of us got our start in the world of Software Defined Radio using a simple SDR dongle and SDR# which continues to improve with updates. And to boot, it’s free. Thanks to all who were involved in developing this software program that’s brought SDR to the masses. You must not have experienced sdr-console, because THAT is the definitive SDR “program” – w/GPU FFT accel, multiple receive slices, mutilple audio endpoints built in, and free (but you should def. donate, once you gasp at the ‘why haven’t I been using this all along’ shock wears off). Good point, I have downloaded this great program. It has a plethora of useful options (not a criticism!) the learning curve is a bit steep for me hi hi. One day I’ll sit down and finally work with it. And yes, if you have the funds to donate, shake the piggy bank and do so. Thank you! I see that the noise floor WITHIN the filter is estimated/measured as reference; even when the carrier has sidebands. I still see some things that I can’t understand; I will look further in it. Yes, your explanation is correct. For my measurements I need to have C/N in a specified bandwidth. 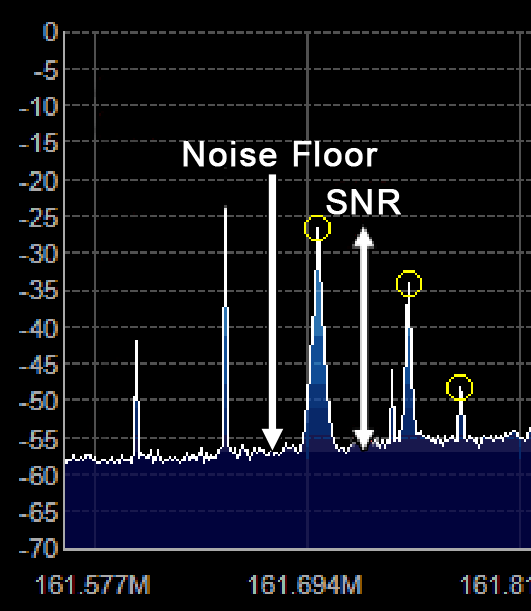 The noise floor in the reading (not the S-meter reading, but the number on the right-hand side of the spectrum) is related to the noise in the FFT bandwidth (one bin). This bandwidth is not specified: I need to recalculate it from the FFT-settings.When I change the resolution, the reading changes corresponding. As it should. There is always the need to calculate the BIN bandwidth. Or do I oversee something simple….. My measurements are always related to radio bandwidth 3 kHz; I set the filter to that bandwidth and take the reading from the level indicator (left-hand pane). Better suggestions? Please! All is very well explained. Thanks. One question: what is the meaning of the number on the right-hand side of the spectrum display. In the figure “pager causes noise floor rises” above it is visible and gives value 3. In my application it is changing the value continuously and I can’t get a logic explanation what it is measuring. Anybody? The level of the signal inside the highlighted IF in relation to the noise floor in dB.